This article is the last in a three-part investigation into American University’s Board of Trustees. That’s how Mallory Payne, a graduate student, responded when asked what she knew about the American University Board of Trustees. Other students didn’t know much more. “I don’t know a single thing about them,” Karan Tekwani, a freshman, answered. Sophomore Erin McBrairty wasn’t even sure what the Board is. Nachiketh Mamani, a junior, said. In the AU hierarchy, the Board sits at the top. Trustees are the final level of approval for many major campus initiatives like creating of new degree programs, selecting the university president and allocating AU’s budget. Despite this expansive influence, the Board remains a mystery to many on campus. The confidential nature of the Board adds to its mysterious presence on campus. Confidentiality policies restrict what information can be shared outside of the quarterly board meetings. Memorandums sent about a week after each meeting to the AU community give general summaries and reveal final decisions. “There is this kind of cloaking of certain information, and that’s the way it is.” Andrea Pearson, a faculty trustee, said. The information available to students about the Board is limited. The governing laws and policies of the Board are accessible online, but confidentiality policies restrict what else is available to the public. There is no way to identify or contact trustees on their webpage beyond first and last name. Further, the student trustee serves as the only link between the student body and the Board. A look at other Boards across the nation suggest where AU’s Board falls on transparency. At the most basic level, trusteeship is a voluntary, unpaid position to advance the university through participation in committees and voting sessions during meetings. The Board is comprised of different categories of trustees: three “ex-officio” (including the university president), two faculty, one student, and, 22 trustees who were appointed to their position through the Board’s official channels of trustee selection. The university president, faculty, and student trustees cannot vote. AU is part of the 36 percent of independent institutions in America — private universities governed by a board of trustees or equivalent — that do not have term limits for trustees, according to a 2010 survey by the Association of Governing Boards of Universities and Colleges. Appointed trustees on AU’s board are nominated for a three-year term that ends in three possible ways: they are re-appointed, not re-appointed, or voluntarily depart. Nationally, the average duration of trusteeship is 12 years, divided into three 4-year terms. Ex-officio trustees only remain on the Board as long as they remain in their position, and student and faculty trustees have term limits of one and two years, respectively. Including the three newest trustees inducted in May, the average time the appointed trustees have spent on the board is about 11 years. Gary Abramson is the longest-serving trustee with almost 33 years on the board—nine years longer than the next most senior member, Thomas Gottschalk. AU evaluated term limits during their last governance review and chose to continue the unrestricted system. “We don’t want to lose excellent people to term limits,” Pamela Deese, a trustee for 17 years, said. Trustees complete a self-assessment and a peer-review assessment which inform the trusteeship committee’s decision whether they are re-appointed at the end of their term. A diversity report of the Board was also considered privileged information, according to Taylor. Data about diversity showed that 46 percent of the Board is female and 29 percent are people of color. This information came from Camille Lepre, Assistant Vice President for Communications and Media University Communications, after a second request. The published information on the trustees is limited. The “Current Trustees” page only lists the members with their career description, location and alumni status. This isn’t uncommon for boards at universities. Georgetown University, Harvard University and Stanford University all provide about the same amount of information on trustees. The University of Maryland College Park, a public university, provides similar information with an addition of a photograph. Some schools like Yale University and New York University publish profiles for their trustees. None of the colleges mentioned provide direct contact information for individual trustees. Yale provides a portal to send to the Board as a whole, and Stanford provides a general email to contact the Board. AU also provides a general email ([email protected]) to contact the Board, but it is not posted under a “contact” page nor with the list of current trustees on the Board’s web pages. The connection between the Board and the rest of the AU community is less direct. Trustees depend on the student and faculty liaisons to be the main connection between the Board and the respective bodies according to Pearson, Grewal, and Valentina Fernández — the student trustee for the 2017-2018 school year. Trustees can connect directly with the community when they come to campus. Trustees often come for events or when there are large issues affecting the community, Grewal said, specifically citing trustees’ presence at last year’s town hall after the posting of a confederate flag poster. Deese, one of the 12 local trustees within the appointed group, tries to participate in campus events as much as possible. She went to a dean’s retirement party, the Parkland students event, a Breaking bread luncheon, and All American Weekend during the two weeks surrounding her interview with AWOL. Trustees are given a list of every major event on campus. On that list, Taylor highlights the most important events, like graduation and convocation, for board members to attend, Deese said. Fernández estimated that Jack Cassell, chair of the Board, is at AU at least once every other week. He lives in Florida. The chair of the Board and the university president organize interactions between the community and “key decision makers” least biannually, according to a “Self Study” done in 2014. For their meeting on November 16, the Board hosted a breakfast with about 40 students who were able to voice their experiences and suggestions. The previous year’s breakfast was very helpful for trustees, according to Fernández and Grewal, who was shadowing Fernández as the student trustee-elect during that time. They each helped organize the breakfasts during their year as student trustee. A main focus for Grewal is communication between elected student leaders, herself, and the Board. Elected student leaders from the undergraduate, graduate, and law schools select three applicants for student trustee to be reviewed by the trusteeship committee, who nominates one to be approved by the Board. Both Grewal and Fernández agree that the current application process is better than holding an election. They both cited the lack of knowledge among students about trustees as one reason an election for the position wouldn’t be a good option. According to Fernández, the student trustee requires certain skills — like being able to think strategically and long-term visions for the school — qualities which she says the Board is best at identifying. Due to the non-disclosure agreement all trustees must sign, what student and faculty trustees can share with their respective bodies is limited. Even with this confidentiality agreement, non-voting members must sometimes leave the room while the voting members of the Board discuss a matter. These closed-door sessions usually happen once a meeting and can be as brief as 15 minutes, although closed sessions may be longer depending on the topic, according to Pearson. The search for the university’s next president in 2016-2017 school year, for example, had longer and more frequent closed sessions due to the potential for high-profile candidates, Pearson said. “It’s not transparent, but I understand why that’s the case,” she said. The student trustee and two faculty trustee positions were added to the Board after students, faculty, and the United States Congress called for increased transparency during a major structural reform. 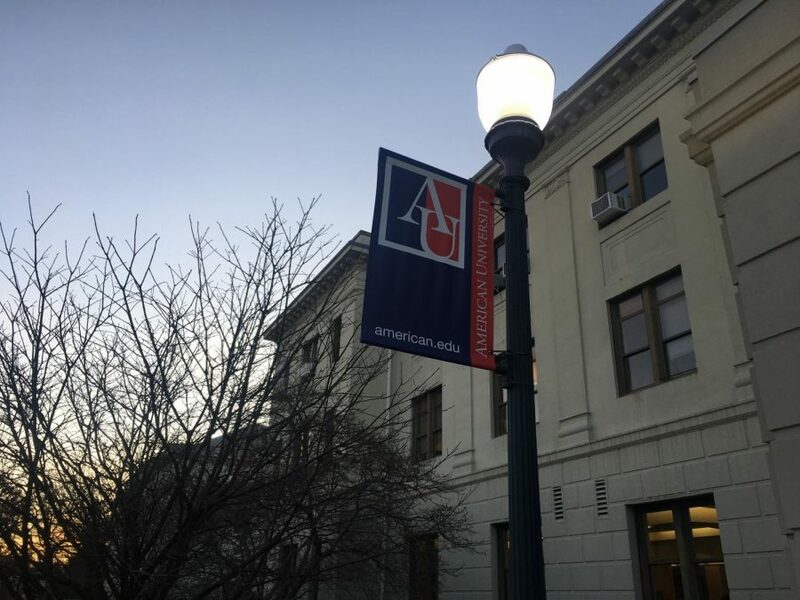 The reform came in 2006 after Benjamin Ladner, the university president preceding Neil Kerwin, misused university funds, and the Board gave him a severance package many at AU believed to be an “exorbitant ‘golden parachute,’” according to articles in The Eagle archive. Many students and faculty, including professor emeritus Stephen Cohen, called for voting privileges of student and faculty trustees, but trustees cited a conflict of interest, according to several articles in The Eagle archive. AGB does not endorse voting privileges for student trustees for this reason, but supports non-voting student trustees as a way to “enrich” the work and understanding of the board. In 2010, 20.1 percent of independent institutions had at least one student trustee on their board compared to 70.8 percent of public institutions, according to AGB. The number of those student trustees having voting powers has decreased from 9.3 percent in 1997 to 8.5 percent in 2010 in independent institutions while it has increased in public institutions from 20.5 percent to 50.3 percent. Pearson expressed more ambivalence towards the non-voting status. In AGB’s 2010 survey, 14.1 percent of independent institutions had a non-voting faculty trustee, 4.4 percent more than public institutions. With two faculty trustees, AU is above the national median of one faculty trustee. AGB also said that having faculty trustees with voting power on university boards would be a conflict of interest. According to Section 6 the Board’s bylaws, no one—except for the university president and the two faculty trustees, who are all non-voting board members—can be a full-time or part-time employee of the university. Deese is currently an adjunct professor at the Washington College of Law and teaches in the spring. When asked how this creates a conflict of interest with her role as a voting trustee, Deese said conflict of interest can come from an issue, but are not necessarily inherent from a position. All trustees must sign a conflict of interest disclosure form before coming to the board, according to the 8th number on their statement of commitments. Despite their non-voting status, Fernández, Grewal, and Pearson felt that the Board respects their voice. Even with “little things” such as the recent issues surrounding Dining Dollars no longer being accepted at Megabytes, Grewal felt that trustees care about her opinion. Fernández recognized the disconnect between the Board and the student body, but believes in their intentions. Pearson said she appreciates the Board and their passion for AU. However, knowing information about the trustees — like who they are and what they do — would be helpful when coming into the Board as a new member, Pearson said. Edit: An edit was made to acknowledge the AU Board of Trustee’s email.